Feel what it's like to be a modern day star when Madame Tussauds Las Vegas puts you in the spotlight with your favorite celebrities! This unique interactive museum lets you in on the action - try your hand on the American Idol stage - will Simon like your performance? 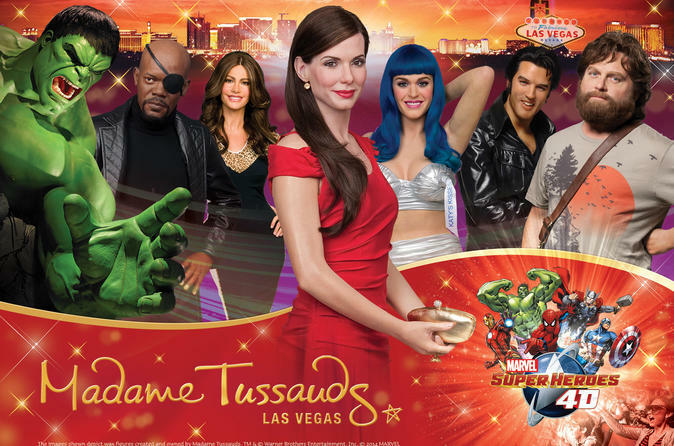 Try it all and more at Madame Tussauds Las Vegas. Additional upgrades to a romance package are available. Snap a photo with your favorite movie stars, athletes and Vegas legends reliving the times, events and moments that made the world talk about them. The ropes and poles have been removed so you can truly stand along side the wax version of your favorite famous stars! UFC sports legend Chuck Liddell - Come take a picture with UFC® Hall of Famer Chuck Liddell, "The Iceman"Liddell the first mixed martial arts (MMA) fighter to be immortalized Madame Tussauds Sports Arena. One-on-One with Shaq - Go head-to-chest with basketball's most intimidating superstar on his home court! With his size 22 shoes firmly on the ground and 300 pounds intently blocking the hoop, Shaquille O'Neal is waiting to block whatever shots are thrown at him. Towering at over nine-foot tall with his arm fully extended, Shaq sweats with anticipation as flashbulbs illuminate the room and the sound of the crowd is deafening as the shot is made. Marvel Super Heroes 4D Experience - "Meet" and take pictures with your favorite super heroes. The highlight of your experience will be the 360º animated 4D cinema attraction, complete with high impact special effects from water and wind to tremors, making you ‘feel’ like part of the action! For a more romantic experience, upgrade to the Duo or Trio packages where you can enjoy a smooth and romantic glide down the outdoor Grand Canal in an authentic Venetian gondola. Float beneath bridges as your gondolier sweeps you down the outdoor Grand Canal for a ride like no other. Please note that this is a shared ride. An extra fee can be paid direct to have a private ride. Lunch at Zeffirino's is available daily from 11:30am to 3:30pm, dinner at Tintoretto's daily from 3:30pm to 12:30am. Menu options are subject to change. Special Offer - Book and save 16% compared to the local operator's prices for admission only or save between 15% and 20% compared to the local supplier's prices for the Duo or Trio Packages! - Book Now!